Yesterday the shortlist for the Blogger's Blog Awards came out and today students across the country got their A Level results and together they've got me thinking about a few things. At first I was a little gutted not to be shortlisted for an award, I think anyone would be and I still get upset sometimes that I had to drop out of school 3 months into my A Levels but it all got me thinking about some of the things that I have achieved. When I first starting talking about my health and Marfan Syndrome on my blog the goal was always that talking about it would hopefully do some good, whether that be raising awareness or supporting others and making them feel less alone. Life has been pretty non-stop though and I haven't really had chance to take a step back and see what kind of impact I have had until now. I sometimes think that I haven't achieved much at all and that what I'm doing is pointless but after looking back at some of the things I've done over the past couple of years I can see now that I've achieved more than I could imagine. I might not have a blog award or A Levels but I'm pretty proud of myself and wanted to celebrate that a little today, perhaps to remind my future self that I have reached some of my goals. Last year I was put in contact with a charity, the Hypermobility Syndromes Association (HMSA), who help support people with a hypermobility syndrome like Marfan and EDS. They asked me if I would like to share a little about what life is like living with Marfan Syndrome in their journal (their bi-annual magazine) and I jumped at the chance. I was finally given a real opportunity to educate people and raise awareness of my often unheard of condition. 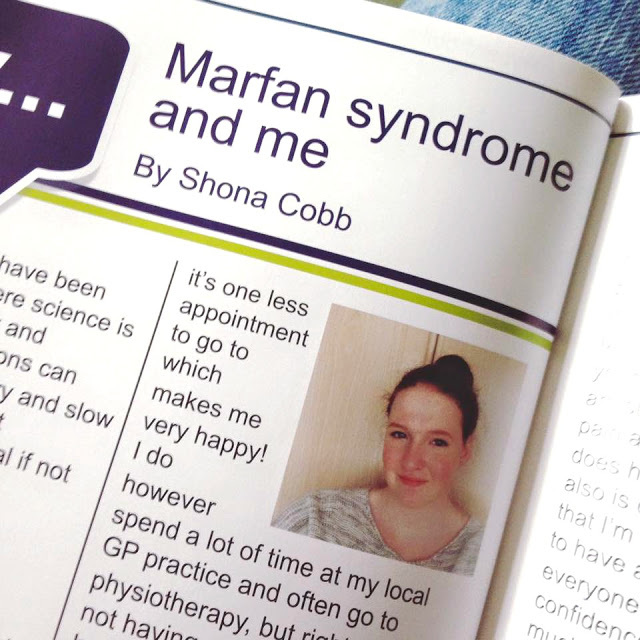 Marfan is very often left out of the conversation when people talk about hypermobility syndromes so I was more than happy to share my story and it was a little surreal to see my words printed out in a professional magazine. This year I then took the next step to volunteer with the charity and now I'm often their go to person if anything Marfan related pops up since I'm the only volunteer with the condition! Recently I've also been given the opportunity to work with another charity, Scoliosis Association UK. They got in contact with me after reading my scoliosis story that I shared for International Scoliosis Awareness Day and hopefully I'm going to be working with them really soon on a few things. My type of scoliosis is syndrome scoliosis, rather than the much more common adolescent idiopathic scoliosis and they are keen to share my story to inform people of how having a syndrome, such as Marfan, alongside scoliosis affects things such as having spinal fusion surgery. I really hope that sharing my experience will help others who do not have the usual scoliosis type as such information was not around when I had my surgery and even my surgeon wasn't sure how my recovery, for example, would differ from others. I hope that by talking about Marfan Syndrome on my blog and social media and sharing my journey that I have raised awareness of the condition. Even if more people at least know the name then I am happy and perhaps a handful of you know some of the symptoms and physical features to look out for now which would be even more incredible! I sometimes wonder if I'm doing the right thing by sharing my story so openly but if I've even raised awareness of Marfan by just a tiny bit then it is all worth it. Lastly this is a bit of a more general achievement and something that I never give myself credit for but I'm pretty damn proud of myself for just continuing blogging through everything. 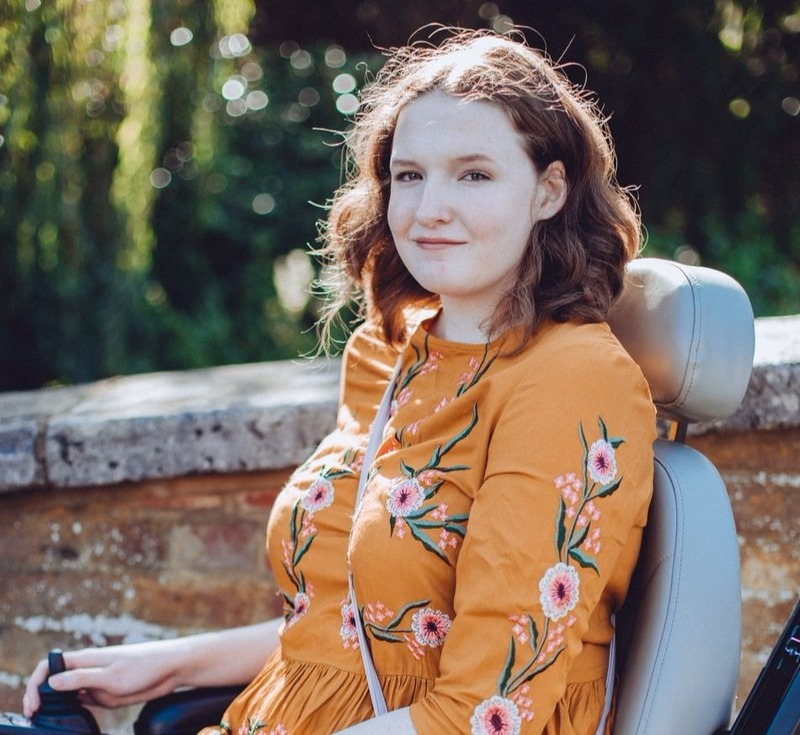 Since starting blogging nearly 5 years ago I've gone from having mild aches and pains to then having 3 major surgeries and now having to use a wheelchair/powerchair and the only constant that has really continued through all that is my blog. I'm not sure how I've managed to keep it going to be honest and of course there have been times when I have questioned whether I should continue or not but even after having a couple of months off I always come back to it. This is just my little space where sometimes I can get away from everything by talking about my favourite lipsticks or I can openly confront my health problems which in the long run has really helped me with acceptance. I think what I'm trying to say for once is that I'm proud of myself what I've achieved. For so many years I had a very simple plan which really was only based of doing my exams and going to university so when those dreams shattered I found it difficult to focus on building new goals but I think I've finally found something that I can be proud of. If you are feeling down or like you've not reached your goals then look back on what you have achieved, even if they are only small achievements, because I guarantee it will make you smile. You are an incredible person, Shona, and I pretty much try to shove that in your face every time I tweet you! Haha! You are doing some brilliant things to highlight your condition and helping others that are having the same problems as you!